I began this thread by describing needs of my freight car fleet for additional 40-foot flat cars with fishbelly side sills, such as the USRA flat car design, available in a very nice kit by Red Caboose. This is a straightforward kit, so my assembly of it was not described, except to point out where I deviated from the standard assembly process. You can read that first post at this link: http://modelingthesp.blogspot.com/2018/07/adding-some-40-foot-flat-cars.html . There are some interesting details to this kit, which offer an opportunity for the modeler to make a variety of changes in its appearance. For example, during the kit assembly, once the stake pockets are installed but before details like grab irons and sill steps are attached, it is worth deciding about a couple of common prototype details that you can add. One of these, that is pretty visible on a flat car, is the brake wheel and staff. We are accustomed to vertical brake staffs, and model flat cars are usually modeled with the brake staff fully extended. But most railroads purchased a drop-staff mechanism for these cars, permitting the brake staff to be dropped down out of the way of long loads. Shown below is one example of such a mechanism, this one from Universal Draft Gear Attachment Company. It has a simple locking device which permits the brake staff to be at full height, or for the wheel to be down onto the platform of the flat car, with the shaft still clear of the rail head. This photo is from the 1928 Car Builders’ Cyclopedia, page 1129. This particular drop-shaft arrangement does not have a pocket in the car decking so the wheel can lie flush with the deck top, but the wheel simply rests atop the planking. But a car purchaser could specify that such a pocket be built on the car, if flush placement was desired. 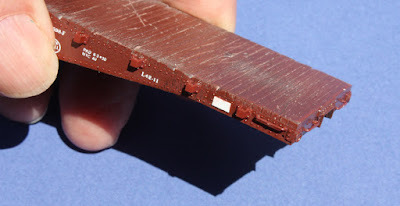 For the modeler, it is the work of a few minutes to cut a semi-circular pocket in the end decking. It might be noticed by the experienced modeler, that the Red Caboose flat car is designed so the brake staff is near the outside edge of the car end. This was indeed the arrangement on the New York Central flat cars, which are effectively the prototype for this kit. Shown below is a NYC photo of one of the cars of Lot 598-F, when the 300 cars were new in 1930, and the brake staff location is evident. 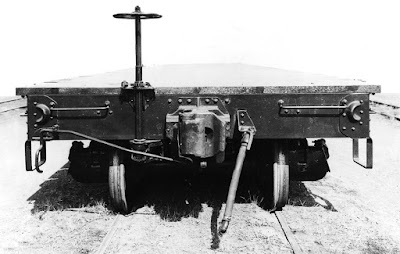 Most flat cars, however, had the brake gear near the car centerline, as was true on most other freight cars, too. Shown below is an example for a flat car (it happens to be an SP photo of Class F-70-5, and the brake shaft is a drop type). If the railroad you are modeling located its brake gear this way, you may want to modify your Red Caboose kit accordingly. Note also that here the end grab irons are farther from the coupler pocket than on the Red Caboose USRA kit. I am modeling one New York Central car, for which I will place the brake staff as the kit directs, and one car for Chicago & North Western, for which I will move the staff to the location you see above. Freight cars almost always had route card boards. Red Caboose supplies none, perhaps a wise choice, since every railroad seemed to have its own standard location. Prototype photos are your friend in finding out where your model should have these. The NYC cars had them either between the right-hand pair of stake pockets, or between the third and fourth pockets (see photo above). I just used a piece of scale 2 x 6-inch styrene strip. Another feature commonly seen but not included in the Red Caboose kit (nor in the USRA design drawings) is end stake pockets. Most railroads specified these for most of the flat cars they purchased or built in home shops. They are readily added by drilling a no. 55 hole, then squaring its shape with a square needle file. It just takes a minute. When both the end stake pockets, and also the recess for the dropped brake wheel, are added, you can achieve an appearance like the photo below. And you may recognize that modeling the lowered brake wheel, in addition to being a fairly common prototype sight, also removes the vulnerable tall brake staff from your model. (Note, too, the easily achieved irregular plank ends on the decking.) The lowered brake staff is just visible below the brake wheel. The end grab irons are in the kit location. With these details taken care of, I can move on to final decoration of the model. That will be presented in a following post.